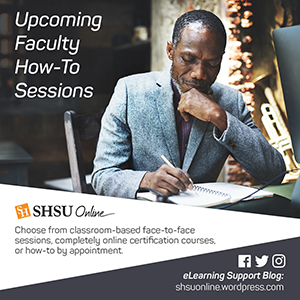 The fall semester brings with it many ways for faculty to work on their technology skills with SHSU Online. September will have its normal slate of face-to-face how-to sessions and completely online offerings as well as something new for the fall! *Schedule your technology training by appointment: We’ve taken something that SHSU Online has always offered informally and made it easier than ever to receive. You can schedule a one-on-one session that covers any of our how-to topics or just meets a need you are having currently. Don’t have an hour to dedicate to sitting in a classroom to wait for the 5 minutes of exactly what you want? A technology training by appointment session is geared to cover exactly what you want to cover! Visit our technology training appointment form, select By Appointment from the session drop-down, select a topic or pick other and create your own, choose your availability and location and submit the form. We will then reach out to you and firm up the appointment particulars so you can be well on your way to getting the technology “how-to” you need. Course Building: 2-week course that will equip online instructors with building and sharing content in their online courses. Communication: 2-week course that will cover tools of communication, as well as applicable communication strategies for online course management. Assessment: 2-week course that introduces participants to how to get started assessing their student’s learning in an online class. Teaching Online- Strategies for Success: 2-Week course that presents participants with the opportunity to explore best practices for creating engaging and effective online learning environments. Enroll in one of our monthly face-to-face how-to sessions: Now that the fall 2015 semester is here, take advantage of one of our September 2015 how-to sessions at the MURFF. Providing Audio and Video Feedback to Your Students – This 1 hour, hands-on session shows you how you can leave personalized feedback to your students in the grade center or throughout your course. Learn how to leverage Video Everywhere to make feedback personal when you are grading students or just giving them assignment details. Give your students visual feedback of where they need to make changes on a paper or project by leveraging Kaltura’s screen capturing capability. Not brave enough to put your face on camera? Utilize Blackboard Collaborate’s Voice Authoring tool to leave audio feedback anywhere in your course. Blackboard Bootstrap – This 90 minute session is for those folks who may be a little behind the 8-ball when it comes to Blackboard skills, but still need to use Blackboard when the semester starts. Learn how to put content into your course, communicate with your students and assess their progress. Bring your digital assets with you and be ready to get to work! Blackboard Rubrics – Participants will learn how to use the Rubric tool that lists evaluation criteria for an assignment, and provide a means to convey expectations to students for the quality of completed assignments. This session lasts approximately 60 minutes. ProctorFree – Online Proctoring for Blackboard Exams and Quizzes – This one hour session covers how to use ProctorFree for your online exams & quizzes in Blackboard. ProctorFree is an on-demand, automated online proctoring service that deters cheating in an online testing environment. Using biometric and machine learning technologies, ProctorFree has eliminated the need for a human proctor during testing. This innovative technology creates a convenient testing option for distance education students and increases the credibility of online certificates and degrees for higher education institutions. Kaltura: Lecture Capture in Blackboard – Adding video to our Blackboard course just became easier! This 60-90 minute session covers how to add video to your Blackboard course using the Kaltura Mashup tool. Attendees will learn how to record and upload video from their webcam as well as capture what is on their own computer screen (PowerPoints etc.). Visit our how-to session sign-up page and enroll today! BB 1st Week – Studies have shown that the first week of an online course is key for your students. The activities and interactions that take place in that first week can influence the rest of the semester. There are strategies that you can employ that ensure that the start of your course that will help you and your students have a successful learning journey. This one-hour session will outline activities, ideas and strategies you can use during the first week of your course. Assessment Protection and Lecture Capture! As part of our continued effort to ensure you are able to protect the integrity of your online assessments and add a video/lecture capture element to your courses we are offering ProctorFree assessment protection courses as well as Kaltura Lecture Capture sessions. Blackboard Learn: Designing Engaging Content This self-paced, completely online, Designing Engaging Content course is put together so that SHSU instructors learn strategies for effectively designing and organizing content to increase student engagement within Blackboard courses.